08/09/16 -- Soycomplex: Beans settled with nominal gains as prices close back in on the $10/bu level. The strong demand/record US production conundrum dominates. There were no daily sales to China or unknown today to back up the demand side of the coin however. The trade is looking for the USDA to raise soybean yields to 49.2 bu/acre in next Monday's WASDE report (48.9 bu/acre currently), with production increased to 4.089 billion bushels (up 29 million). Old crop edning stocks are forecast tightening to 232 million bu (255m previously), with new crop carryout unchanged at 330 million bu. CNGOIC forecast China's 2016/17 soybean imports at 85 MMT, some 2 MMT less than the USDA. August imports were 7.67 MMT, little changed versus Aug '15 or Jul '16. CNGOIC see China's soybean production at 13.1 MMT vs. 12.2 MMT from the USDA. Trade estimates for tomorrow's weekly export sales report are 1.0-1.5 MMT. Oil World said that Brazil's Aug soybean exports were down 26% at 3.83 MMT. Jan /Aug exports though were still up 5% year-on-year at 48.17 MMT. Ukraine are seen increasing winter rapeseed plantings by 10% for the 2017 harvest. Production in 2016 was down 31% at only 1.1 MMT. Sep 16 Soybeans settled at $9.92, up 1/4 cent; Nov 16 Soybeans settled at $9.76 3/4, up 1 1/4 cents; Sep 16 Soybean Meal settled at $325.10, up $1.30; Sep 16 Soybean Oil settled at 32.94, up 13 points. Corn: The market closed around 5-6 cents higher on short-covering. Weekly US ethanol production came in lower at 998,000 barrels per day. The trade is looking for an average US corn yield of 173.4 bu/acre in Monday's WASDE report (down from 175.1 bu/acre last month). Ending stocks are pegged at 2.329 million bu vs 2.409 million in August from the USDA. China sold 476.5 MMT of state-owned corn reserves out of the 3.6 MMT offered for sale at auction. Another 1 MMT will be auctioned off tomorrow. CNGOIC pegs China's corn crop at 219.5 MMT, up 0.5 MMT from August and a 5.1 MMT increase from 2015/16. South Korea's MFG are tendering for 70,000 MT of optional origin corn. Trade estimates for tomorrow's one day delayed weekly export sales report are in the region of 800,000 MT to 1.3 MMT. 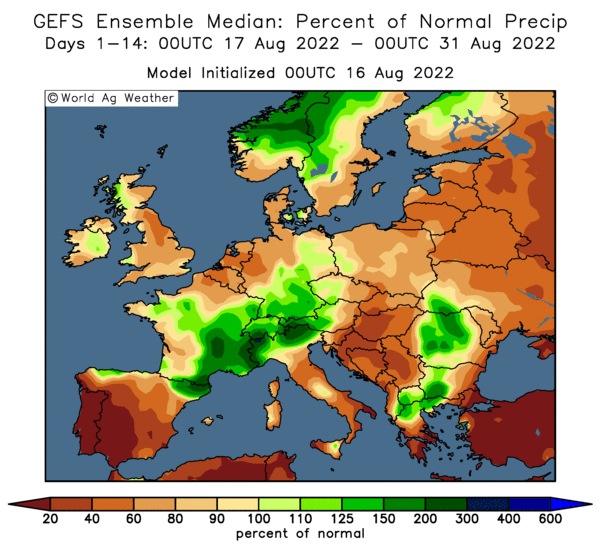 Warm and dry conditions may be taking their toll on corn production potential in Europe, some are saying. French production might be the lowest since 2003 in what has been a disastrous year for their growers. Romania, Bulgaria and Poland are also said to be suffering. Sep 16 Corn settled at $3.27, up 6 cents; Dec 16 Corn settled at $3.38 1/2, up 5 1/4 cents. Wheat: The wheat market closed firmer on all three exchanges. Short covering and hopes for a pick up in US exports were behind the move. There may have been an element of position squaring ahead of Monday's WASDE report too. The US is expected to sell 300 TMT of wheat to Morocco under a special inter-governmental deal. Morocco are also in the market for what will probably be EU wheat. French wheat exports are slowing, as expected following the poor harvest there. Other EU nations (Romania/Germany) are picking up the baton for now, but may not have much to sell themselves once we get into the second half of the season. That could provide an opportunity for US wheat it is thought. Dr Cordonnier reports that wheat harvesting in Brazil's Parana state is 2% done (10% a year ago), with a harvest of 3.3 MMT expected - similar to a year ago despite a 14% reduction in plantings. Russia said that it had exported 10.9 MMT of wheat Jan/Jul 2016 up sharply from 6.8 MMT the previous year. Algeria are thought likely to have bough between 300-500 TMT of wheat in their tender. Weekly export sales for wheat tomorrow are expected to be in the region of 350-550 TMT. Sep 16 CBOT Wheat settled at $3.77, up 1 3/4 cents; Sep 16 KCBT Wheat settled at $3.92 1/2, up 7 3/4 cents; Sep 16 MGEX Wheat settled at $4.95, up 3 1/4 cents. 08/09/16 -- EU grains closed mixed. Customs data suggests French exports are well down on year ago levels. At the close Nov 16 London wheat was up GBP0.25/tonne at GBP122.00/tonne, soon to expire Sep 16 Paris wheat was EUR3.00/tonne lower to EUR145.25/tonne, although other months were mostly fractions of a euro higher. Nov 16 Paris corn was up EUR0.25/tonne at EUR161.250/tonne, Nov 16 Paris rapeseed was EUR2.25/tonne lower at EUR377.00/tonne. The HGCA reported the UK wheat harvest at 90% complete, with yields averaging 7.8-8.0 MT/ha, in line with the 5-year average 7.9 MT/ha. "Quality of winter wheat crops this season tended to be good. There were rare reports of samples with discoloured or small grains and ergot in which led to penalties at intake, but these loads are in the minority," they said. Spring wheat is 60% harvested and spring barley 70% done. Winter OSR harvesting is over with yields only averaging 3.0-3.2 MT/ha versus the 5-year average of 3.6 MT/ha. Customs data shows that Brussels released 521 TMT worth of soft wheat export licences this past week, taking the season to date total to 5.1 MMT. French soft wheat exports in July were down 14% at 1.1 MMT, with exports to non-EU destinations of 652 TMT (-5%) and those within the EU at 432 TMT (-24%). Top home was Algeria with 290.5 TMT, although this was down 32% versus July 2015. India also took 108 TMT. French barley exports in July were down 24% at 715 TMT (China took 259 TMT of that total). Media reports suggest that the leading French export hub of Rouen exported no grains at all for the week ended Sep 7. By contrast, Russia said that their Jan/Jul wheat exports were 10.9 MMT, up 60% versus 6.8 MMT a year previously. Ukraine's 2016 grain harvest was forecast at 63.5 MMT by APK Inform, up 3 MMT on a year ago and only just short of the record 63.9 MMT produced in 2014/15. Winter rapeseed plantings in Ukraine are reported complete on 601k ha, 54% more than this time a year ago. Final plantings are estimated at 724k ha, up 10% on a year ago. 07/09/16 -- Soycomplex: Beans closed with decent gains. 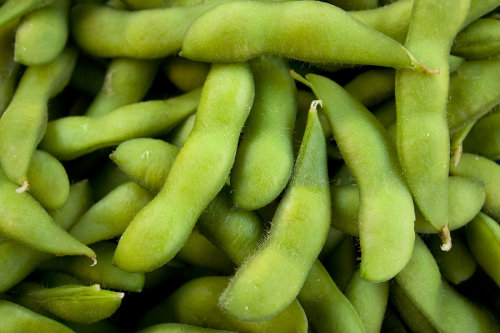 The USDA announced 220,000 MT of soybeans for delivery to China and 264,000 MT for delivery to unknown destinations during the 2016/17 marketing year. Brazil's exports are dropping off. Jun/Aug bean exports were 12.54 MMT vs 17.71 MMT a year ago. Argentine exports Jun/Aug are 4.26 MMT vs 4 MMT a year previously. Linn Group forecast US yields of 49.6 bu/acre and production at 4.17 billion bushels (USDA currently 48.9 bu/acre and 4.060 billion bushels). Now that the old crop season has ended the trade is thinking that 2015/16 exports could top 1,940 million bushels vs. the USDA estimate of 1,880 million, said Benson Quinn. The USDA is forecasting 2016/17 exports at 1,950 million, yet the current pace of new crop sales is 40% above last year’s pace to date, they note. This suggests that new crop exports could also be raised in the next WASDE report due Monday. Sep 16 Soybeans settled at $9.91 3/4, up 17 1/2 cents; Nov 16 Soybeans settled at $9.75 1/2, up 15 3/4 cents; Sep 16 Soybean Meal settled at $323.80, up $6.70; Sep 16 Soybean Oil settled at 32.81, up 5 points. Corn: Corn closed higher. Linn Group forecast US 2016 corn yields of 171.5 bu/acre and production at 14.88 billion bushels (the USDA are at 175.1 bu/acre and 15.153 billion bushels). The USDA's Good to excellent ratings for this year's corn crop are in the top 5 highest of the last 30 years, said FCStone. The US attache to Mexico lowered their estimate of the corn crop to 23.5 MMT (USDA 24.5 MMT). The trade is expecting the USDA to lower Brazil's 2015/16 corn crop from the current 68.5 MMT to maybe 67.0-67.5 MMT on Monday. Production in 2016/17 is expected to be much higher though. The Russian and Ukraine new crop corn harvests are in their very early days (1-2% complete) and progressing well under warm and dry conditions. Ukraine said that it had exported 575 TMT of corn so far this season. Exports will pick up soon as the harvest develops and wheat and barley shipments die down. The usual weekly ethanol production and stocks data from the US Energy Dept are delayed a day due to Monday's Labor Day holiday. Sep 16 Corn settled at $3.21, up 4 cents; Dec 16 Corn settled at $3.33 1/4, up 4 3/4 cents. Wheat: Wheat closed a touch firm on bargain-hunting as prices hover just above 10-year lows. The trade is hoping that there may just be a chance of US wheat picking up some export business into Morocco and Algeria in their tenders with French wheat seemingly out of the market. Russia's harvest stands at nearly 98 MMT off a little over 75% of the planned area (wheat accounts for 67.5 MMT of that total). Ukraine said that it had exported 7.21 MMT of grains so far this season, of which 4.2 MMT was wheat. Egypt were reported to have rejected 63,000 MT of Russian wheat due to the presence of ergot under their new zero tolerance rules. Exactly where this leaves them at their next tender remains to be seen. 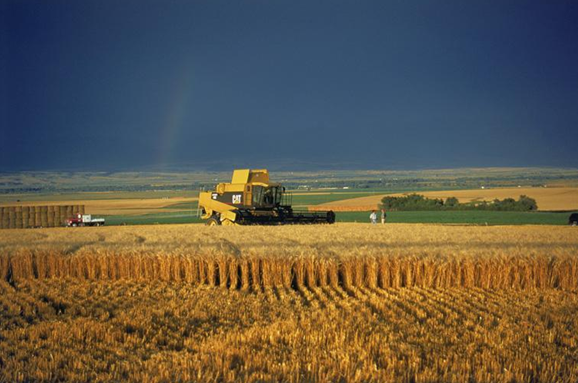 Stats Canada reported that total Canadian wheat stocks are down 27% from a year ago at 5.2 MMT. This was above average trade expectations. Warm and dry conditions are seen delaying winter wheat planting in Ukraine. 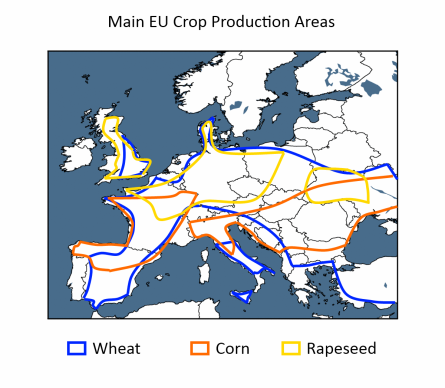 Wheat harvesting in Europe is winding down and plantings there will soon be underway too. Sep 16 CBOT Wheat settled at $3.75 1/4, up 4 1/4 cents; Sep 16 KCBT Wheat settled at $3.84 3/4, up 3/4 cent; Sep 16 MGEX Wheat settled at $4.91 3/4, up 1 3/4 cents. 07/09/16 -- EU grains finished mixed, but mostly a touch higher. Soon to expire Sep 16 Paris wheat is getting technical. The day ended with Nov 16 London up GBP1.50/tonne at GBP121.75/tonne, Sep 16 Paris wheat was EUR3.75/tonne easier at EUR148.25/tonne, Nov 16 corn was unchanged at EUR161.00/tonne and Nov 16 rapeseed rose EUR1.50/tonne to EUR379.25/tonne. For Paris wheat this was the lowest close on a front month since May. As mentioned September is getting technical due to lack of storage at the future stores. Dec 16 was down only EUR0.25/tonne today and the the premium between that and Sep 16 is now more than EUR10/tonne. The pound was a bit weaker today which aided London wheat's rise from yesterday's 2-month low. Ukraine said that it's 2016 harvest was 69% complete on 9.9 million ha at 38.5 MMT. The Ukraine corn harvest is 1% done at 144 TMT and progressing nicely under warm and dry conditions. These conditions are hindering winter wheat planting though, which is waiting to start. Winter OSR plantings are progressing anyway at 81% done on 588k ha. The Ukraine Ministry said that exports so far this season stand at 7.213 MMT, including 4.2 MMT of wheat, 575 TMT of corn and 2.4 MMT of barley. As well as tendering for wheat Algeria announced a tender for 50,000 MT of feed barley for Oct shipment. Morocco are in for 300 TMT of soft wheat and 45 TMT of durum. The USDA's FAS in Russia raised their estimate for wheat production there this year to 72 MMT. Exports in 2016/17 were placed at a record 28 MMT, an all-time high but not as high as some forecasts (30 MMT). A firmer rouble and the fact that wheat quality is inferior to last season might take the shine off exports, they said. The Russian Ag Ministry said that the 2016 harvest is now past 75% done and has reached almost 98 MMT. Wheat is almost 80% harvested at 67.5 MMT. 06/09/16 -- Soycomplex: Soybeans closed higher, helped by strong weekly export inspections of 1.233 MMT, up 33% from the previous week. 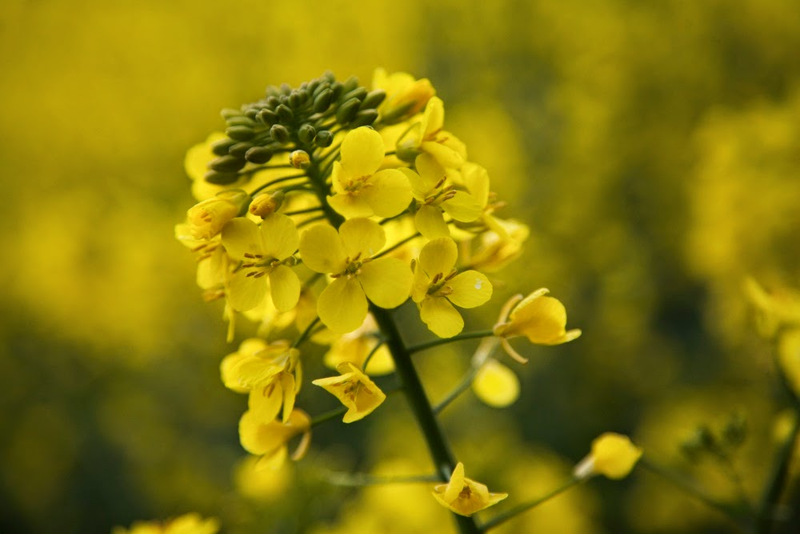 Oil World estimated the global rapeseed crop to contract to the smallest in 8 years, with consumption outstripping production for the third year in a row. The Ukraine Oilseed Association estimated the rapeseed crop there at only 1.1 MMT, down 31% from 1.6 MMT a year ago. The Australian equivalent pegged their crop at 3.39 MMT (USDA: 3.5 MMT). There's talk of a developing La Nina weather pattern. "The La Nina transition is tracking closely with 1998 which saw 95% of trend yields for Brazil and 97% of trend yields for Argentina," said FCStone. Brazilian soybean plantings have been slowing, and are expected to remain static for 2016/17 as growers switch to corn. A similar situation is evident in Argentina where the corn export tax is now zero and soybean exports are still taxed at 30%. The USDA left soybean crop conditions unchanged at 73% good to excellent, they said that 97% of the crop is setting pods and 12% dropping leaves. The latter two figures are exactly in line with the 5-year average. Sep 16 Soybeans closed at $9.74 1/4, up 5 3/4 cents; Nov 16 Soybeans closed at $9.59 3/4, up 7 1/4 cents; Sep 16 Soybean Meal closed at $317.10, up $3.40; Sep 16 Soybean Oil closed at 32.76, up 10 points. Corn: The corn market closed flat. A sharply lower US dollar helped commodities in general today. Weekly export inspections were decent at 1.47 MMT last week (1.15 MMT for 2015/16). CONAB cut their Brazilian corn crop estimate from 68.48 MMT to 66.98 MMT (USDA: 68.50 MMT). Russian fledgling corn harvest is 1.9% done at 273.4 TMT, say their Ag Ministry. The USDA trimmed US crop conditions by one point tp 74% good to excellent, still a very decent number for this time of year. They have 96% of the crop at the dough stage (94% normally), with 76% dented (69% normally) and 18% of the crop mature (20% typically at this time). US DDGS exports topped 1 MMT in July, the largest month since last September, with China the largest buyer taking 358,900 MT. Dr Cordonnier sees Argentine farmers expanding their corn plantings for 2016/17 by 25% to 3.5 million ha. "Most of that increase will occur in the core production regions of the country where the yield potential is the highest and the transportation costs are the lowest," he says. He has production at 35 MMT versus 27 MMT in 2015/16. The Chinese government has started offering $335/hectare to producers who will switch from growing corn to soybeans. The aim is to reduce their domestic corn stockpile and cut the country's dependency on soybean imports. Sep 16 Corn closed at $3.16 3/4, up 1/4 cent; Dec 16 Corn closed at $3.28 1/2, unchanged. Wheat: The wheat market closed lower despite a weak US dollar. Weekly export inspections came in at 639,315 MT, up 11% from the previous week. Harvest pressure may heave been a factor today, the US spring wheat harvest raced to 91% complete versus only 75% normally, the USDA said. Russia's harvest continues to shape up to be a post-Soviet era record. They've harvested 95.6 MMT of grains already off only 73% of the combinable area. (IKAR now estimate final production at 118 MMT). Wheat accounts for 66.3 MMT of that total (77.1% harvested) and barley an additional 17.4 MMT (87.1%). Russian exports so far this season are however down 7% y-o-y at 5.366 MMT (Jul 1 to Aug 31). Wheat makes up 83.7% of that volume (4.49 MMT). Once the Russian export duty is removed on Sep 15 then these should start to pick up again. Russian seaports exported 637.1 TMT of grains last week. 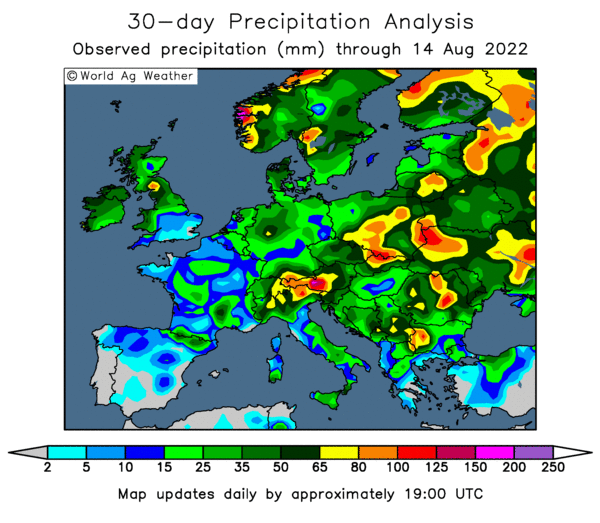 There's continued talk that Ukraine is in need of rain before they can start planting autumn/winter wheat. 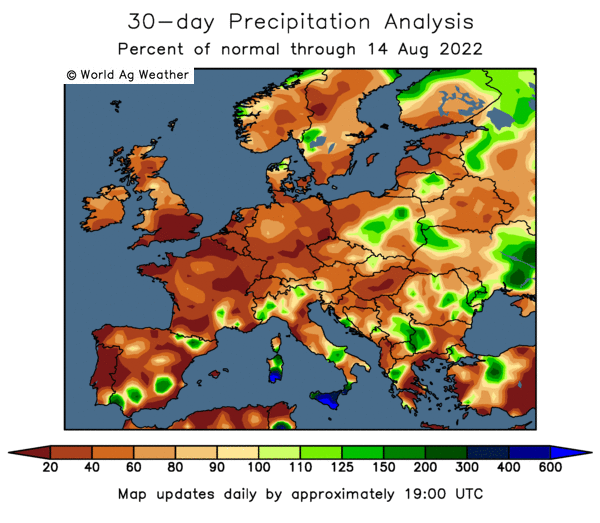 "Argentina’s wheat areas expected to receive some light rains next week but nothing significant enough to stave off the growing dry areas," said FCStone. Jordan tendered for 100,000 MT of feed barley for Feb/Mar shipment. Algeria were in for a minimum 50,000 MT of soft wheat of optional origin, although they are expected to buy more (they purchased 520,000 MT last time). Sep 16 CBOT Wheat closed at $3.71, down 2 1/4 cents; Sep 16 KCBT Wheat closed at $3.84, down 2 1/2 cents; Sep 16 MGEX Wheat closed at $4.90, down 6 1/4 cents. 06/09/16 -- EU grains closed mostly lower to start the week, with London wheat under pressure from a resurgent sterling. 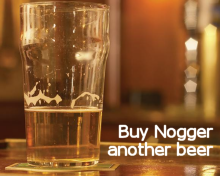 The day ended with Nov 16 London wheat down GBP0.75/tonne at GBP120.25/tonne, Sep 16 Paris wheat was down EUR2.50/tonne at EUR152.00/tonne, Nov 16 corn fell EUR1.50/tonne to EUR161.00/tonne and Nov 16 Paris rapeseed was down EUR1.75/tonne to EUR377.75/tonne. This was a new 2-month low for Nov 16 London wheat. This is due to a combination of recent sterling strength, US markets hitting 10-year lows and bumper Russian production. The 2016 grain harvest in the latter now stands at 95.6 MMT off 73% of the planned area. Wheat accounts for 66.3 MMT of that off 77.1% of plan and barley a further 17.4 MMT (87.1%). Russian exports so far this season (Jul 1 to Aug 31) stand at 5.366 MMMT, of which 4.49 MMT is wheat and 797 TMT barley. Plantings for 2017 in Russia are now at 4.4 million ha, around 25% of the government forecast. US wheat futures in both Chicago and Kansas hit 10 year lows last week on bumper production and the strong US dollar weighing on exports. The pound meanwhile closed at it's best levels against the US dollar since Jun 29 tonight following better than expected post-Brexit economic data. All this is weighing on London wheat, together with a little bit of harvest pressure (especially given the large carryover stocks from last year). In other news, the Ukraine Oilseeds Association estimated rapeseed production there this year at only 1.1 MMT (down 31% from 1.6 MMT a year ago) after dry weather cut plantings last autumn. Romania currently tops the EU wheat export table with 1.215 MMT, closely followed by normal leader France (1.175 MMT), according to EU data. 05/09/16 -- EU grains closed mostly lower to start the week. US markets were closed for Labor Day so fresh news was limited. At the close Nov 16 London wheat was down GBP1.75/tonne at GBP121.00/tonne, soon to expire Sep 16 Paris wheat was EUR3.50/tonne lower to EUR154.50/tonne, although other months were only down fractions of a euro. Nov 16 Paris corn was unchanged at EUR162.50/tonne, Nov 16 Paris rapeseed was EUR2.50/tonne firmer at EUR379.50/tonne. 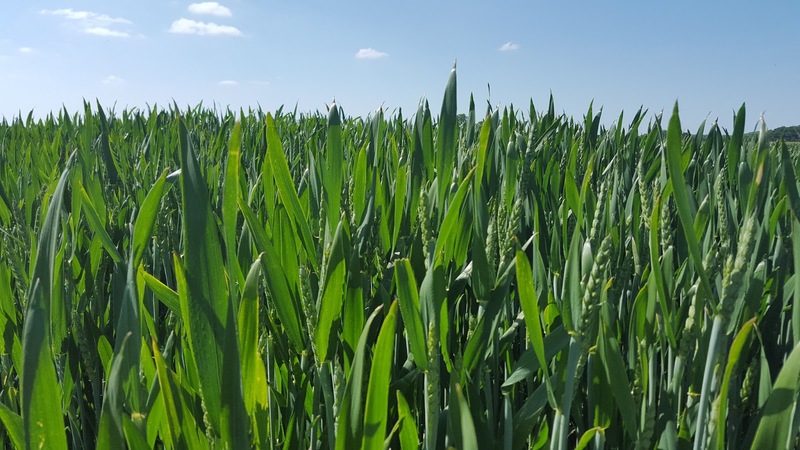 London wheat again fared the worst of the bunch due to an unexpected bout of sterling strength this last few days following some better than anticipated economic news. For Nov 16 this was the lowest close in 2 months. Paris rapeseed was the sole gainer on the back of significant palm oil price rises in the Kuala Lumpur market. Jordan tendered for 100,000 MT of feed barley for Feb/Mar shipment. Algeria were in for a minimum 50,000 MT of soft wheat of optional origin, although they are expected to buy more (they purchased 520,000 MT last time). Russia said that their 2016 grain harvest had now reached 93.4 MMT off 70.4% of the planned area. Wheat accounts for 64.5 MMT of that (73.8%) and barley an additional 17.1 MMT (85%). Their 2016 corn harvest is 1.3% complete at 37.4 TMT so far. Russian growers meanwhile have also sown 19.7% (3.4 million ha) of the planned area for the 2017 harvest with autumn/winter grains. Russian seaports exported 637.1 TMT of grains last week, up sharply from 203.1 TMT the previous week, including 595.2 TMT of wheat, said APK Inform. Ukraine seaports shipped out a little more 661.4 TMT (up from 552.7 TMT the previous week), including 480.9 TMT of wheat, 14.2 TMT of corn and 166.3 TMT of barley, they added. 02/09/16 -- Soycomplex: Beans settled higher on the day, but lower for the week. Pre-weekend consolidation maybe had something to do with today's price action. Certainly the belief that US soybean yields will break all previous records and come in above the USDA's current 48.9 bu/acre estimate haven't gone away Today we had Commodity Weather Group forecasting an average yield of 50.1 bu/acre. Informa gave us 49.5 bu/acre. The flip side of this record supply is current very strong demand for US beans, although there were no sales announced today under the daily reporting system. The weekly Commitment of Traders report sees fund money net long 75,888 lots from 111,722 a week ago as of Tuesday night. China sold 119,000 MT of the 603,000 MT of reserve soybeans offered up at auction today. Sep 16 Soybeans closed at $9.68 1/2, up 9 1/2 cents; Nov 16 Soybeans closed at $9.52 1/2, up 8 3/4 cents; Sep 16 Soybean Meal closed at $313.70, up $0.60; Sep 16 Soybean Oil closed at 32.66, up 46 points. For the week that puts nearby beans down 22 1/4 cents, with meal $7.50 lower and oil down 29 points. 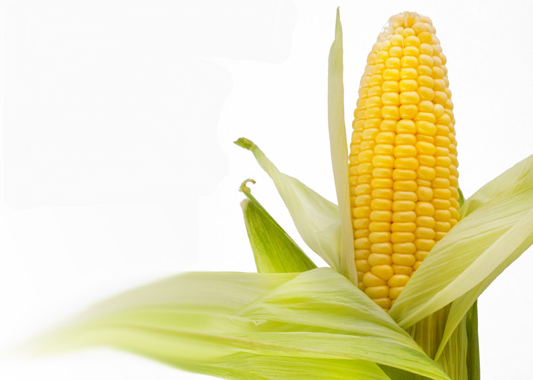 Corn: The market closed around 5 cents higher on the day and with nominal gains for the week. The front month contract made it to $3.01 this week, the lowest on the continuous chart since 2009. Todays's gains were probably consolidation ahead of the long weekend (Monday is Labor Day in the US). Informa today pegged US corn yields at 174.8 bu/acre, slightly below the USDA's 175.1 bu/acre, but at the upper end of private trade forecasts. China sold 595,355 MT of it's corn reserves offered up at auction. The weekly Commitment of Traders report sees fund money net short of 162,503 contracts as of Tuesday night. French corn crop conditions continue to decline, down 3 points to 60% good to very good, said FranceAgriMer. Small volumes (1 or 2%) of new crop corn have been harvested so far in Russia and Ukraine. The US harvest in the Delta/Deep South struggles on under wet conditions. Sep 16 Corn closed at $3.16 1/2, up 5 1/2 cents; Dec 16 Corn closed at $3.28 1/2, up 4 3/4 cents. For the week Sep 16 was up 1/4 cents and Dec 16 rose 3 1/2 cents. Wheat: The wheat market closed higher on the day and mixed for the week. Nidera said that the Australian wheat crop could beat the 2011/12 record 29.6 MMT. Argentine wheat conditions are improving under good weather to 50% good and 13% excellent, said the Buenos Aires Grain Exchange. Plantings there this year are seen almost 20% higher at 4.3 million ha. There's talk of India needing to import anywhere from 3 MMT to as much as 5 or 6 MMT of wheat in 2016/17, almost as much as when they were last a major importer and world wheat prices rose 50% in 2006/07. They booked 52,000 MT of Ukraine milling wheat today. The Indian government caused a stir recently by dropping the volume of wheat that each flour mill can buy from government reserves each month from 5,000 MT to 500 MT, although this was subsequently raised to 2,000 MT after millers protested. Sep 16 CBOT Wheat closed at $3.73 1/4, up 5 cents; Sep 16 KCBT Wheat closed at $3.86 1/2, up 6 3/4 cents; Sep 16 MGEX Wheat closed at $4.96 1/4, up 5 3/4 cents. For the week that puts Chicago wheat 10 1/4 cents lower, with Kansas down 3 1/4 cents and Minneapolis up 3 3/4 cents. 02/09/16 -- EU grains finished mixed, but mostly a touch higher. The day ended with Nov 16 London down GBP0.25/tonne at GBP122.75/tonne, Sep 16 Paris wheat was EUR0.50/tonne firmer at EUR158.00/tonne, Nov 16 corn was up EUR1.50/tonne at EUR162.50/tonne and Nov 16 rapeseed rose EUR3.50/tonne to EUR377.00/tonne. For the week that puts London wheat GBP3.00/tonne easier, with Paris wheat down half a euro, corn down EUR1.75/tonne and rapeseed EUR2.75/tonne firmer. London wheat took the brunt of declines today, and this week, on the back of a firmer sterling which hit one month highs against both the euro (1.1938) and US dollar Friday (1.3350). London wheat's fortunes have been much more closely aligned to currency movements than anything else since the Brexit vote. Talk that India could be about to abolish the current hefty import tax on wheat to ease tightening supplies in the world's second largest consumer of the grain warrants watching. They've already imported more wheat this year than at any time in the last 9 years and are reported to have picked up 52,000 MT of Ukraine wheat today. "There is hardly any wheat available on the open market, production is much lower than the government is citing," the President of the Indian Roller Flour Millers Federation told Reuters. The last time they were in the market in a big way was 2006 when their unusual presence in the international market helped spark a huge price rally. Australia would traditionally be India's largest supplier of wheat, and it looks like they will be well placed to service an increase in demand this season, there's some talk that wheat production there might even break the 2011/12 record 29.6 MMT due to favourable weather. Russia also looks on the cards to bring in a record breaking crop, with 92.2 MMT of grains already harvested off only 69% of the planned area (wheat 61.8 MMT off 72.6%). Planting for the 2017 harvest is already 16.7% complete on 2.9 million ha. The Russian Ag Minister said that the impending abolition of the export tax on wheat could see foreign sales rise by 5 MMT to 30 MMT this season.